Yes winter is coming. I’ve noticed the chill in the air and the smell of cold in the last week and it makes me smile. I’m not a fan of the heat. I’m also not a fan of winter roads so it puts me in a weird love – hate relationship with winter. If I didn’t have to drive I’d be happy with fall and winter all year around – spring’s okay too. So it looks like two elephants or something but these are going to be a pair of slippers for my husband. I got the pattern on Ravelry. They are called Options Slippers for Men. I love how creative knit designers are. 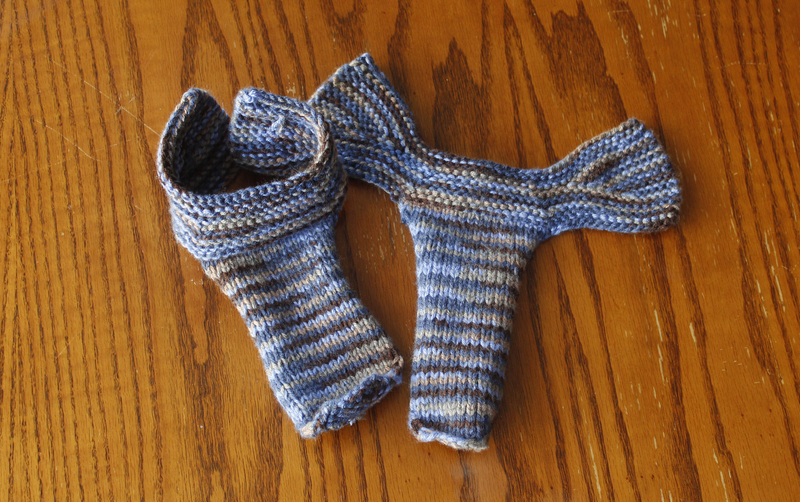 You can knit the same type of item over and over and never do it the same way twice if you want to. Knitting is such a beautiful and organic thing. I still feel amazed that I can take some needles and yarn and create something functional and beautiful. I’m going to make three more pairs of these for my daughters and I. My feet are boats so the men’s sizing will be fine for me and I think the same for my eldest daughter but, my youngest daughter’s slippers are going to require some adjustments to the pattern. I’ll keep you posted with more pictures soon!